Just a quick post about the KHON2 shoot. The film shoot today was fun! The super-charming Tannya Joaquin and cameraman Reed came to our studio and captured Rick working on a couple of cakes, including our all-bamboo cake, which has become one of our signature cakes. Oddly enough, we have 3 all-bamboo wedding cakes this week, a bizarre coincidence we can't explain. 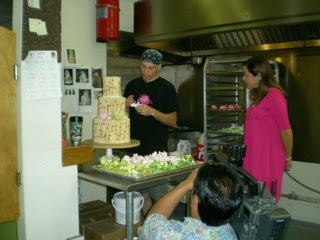 This photo shows Rick starting to place the handcrafted flowers on the bamboo cake while being interviewed by Tannya. The segment airs tonight at 5pm. From "DESTINATION i do" to ... I Do! molars and roots and probes, oh my!